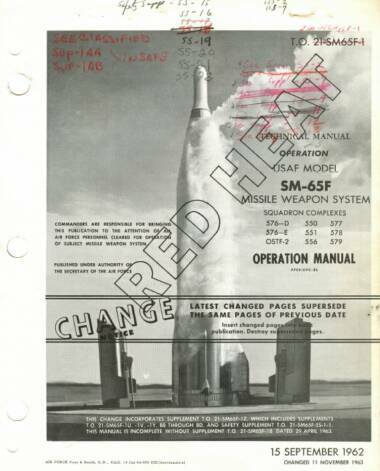 Below is the cover of the TO used during the Cuban Missile Crisis at Site 1 - Champlain..
Is has been updated to the November 11, 1963 documentation release. Click here to see an over view of the Dash-1. Click your back button to return here. -- If I get some interest I will post some of the sections before the end of the year. Otherwise, I'm going to continue to decipher the monthly Air Force Histories for the 556th. (Some of the histories are barley legible due to poor quality control when they were microfilmed). -- If you want so see the Dash-1 sections - send me an email and let me know you're interested. - Speaking of pages, there are 1,270 pages to this TO, not including blank pages, which were not scanned.